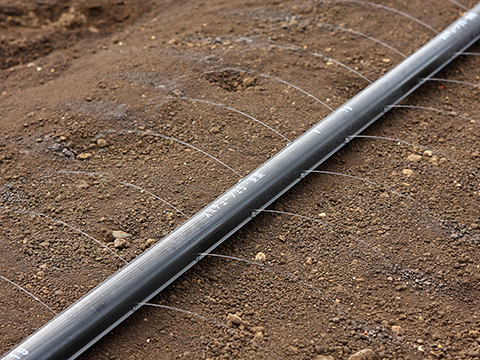 SUMITUBE STRAWBERRY: 60m at water pressure 0.2–0.4 bar. Hole Interval (each side) is 6cm. Hole Size is 0.4mmφ. SUMITUBE TOMATO: 80m at water pressure 0.2–0.4 bar. Hole Interval (each side) is 10cm. Hole Size is 0.4mmφ. SUMITUBE MELON: 100m at water pressure 0.2–0.4 bar. Hole Interval (each side) is 20cm. Hole Size is 0.5mm. "START CONNECTOR 25" can be connected to a 25mm dia. PVC pipe.